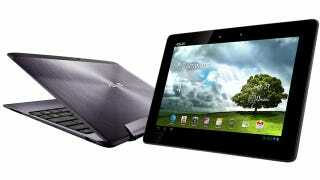 Asus is on a roll with its rebranded ‘Transformer Pads' tablet line, pushing out yet another version. The Infinity series takes the Prime and runs with it, packing either a Tegra 3 or a Snapdragon S4 and a 10.1-inch full-HD screen. The tablet basically looks like the latest aluminium-clad Transformer Prime, but packs a dual-core Qualcomm Snapdragon S4 chip for a 4G-equpped version, and a Tegra 3 for the Wi-Fi-only model. The 8.5mm thick Infinity will sport a beast of a 10.1-inch 1080p (1920×1200) Super IPS+ Gorilla Glass 2-covered screen; 1GB of RAM; 16/32/64GB of storage; an eight-megapixel shooter on the back; a front-facing two-megapixel video chat cam, and HDMI-out. It'll come with Ice Cream Sandwich as you might well expect, and will keep churning for 10-hours without the dock and 16-hours with the keyboard attached.